Learn How to Create a Profitable Growth Investment Portfolio, Right Now—for HALF OFF the Regular Price! Get your special pass to the top stock picks for a profitable growth-investing strategy! Get your subscription to Cabot Growth Investor today, and you’ll get top growth-stock recommendations all the time. And if you hurry now, you can claim your FREE report—for new subscribers only! The Guide to Investing in Growth Stocks. 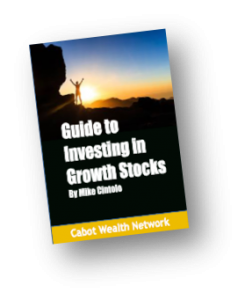 When you subscribe to Cabot Growth Investor right now, you’ll get the full view about growth investing with The Guide to Investing in Growth Stocks—a special free report for new subscribers only. 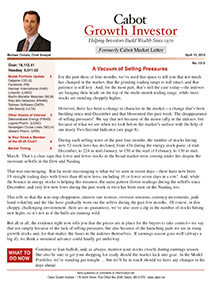 Subscribe today to Cabot Growth Investor and instantly get your FREE growth investing report! When you read this report, you’ll learn how our proven, methodical, data-driven system is your best bet for a growth-investing portfolio. Plus, when you subscribe now, we’ll reveal our next buy/sell/hold recommendations, so you can get started right away! For HALF OFF the Regular Price, You’ll Get Top Investing Advice—Right Now! Must-Read Stock Advice if You Want to Grow Your Wealth—from a Trusted, Reliable, Proven Source. Subscribe to Cabot Growth Investor right now, and you’ll have full and immediate access to Cabot’s stock recommendations, based on a proven stock-picking system.